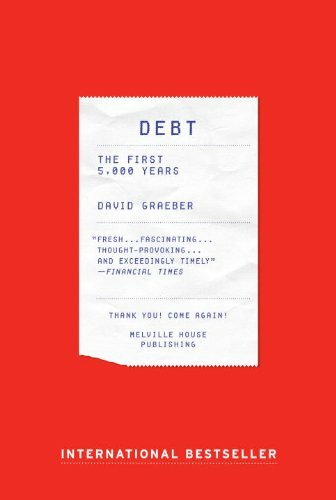 In his latest book, “Debt: The First 5,000 Years,” Graeber argues that the language of debt permeates our common-sense notions of morality to such an extent that the idea that “one must pay one’s debts” seems common-sense. However, Graeber contends, this isn’t actually how the financial system works. First, debt cancellation (such as the jubilee in Mesopotamia) has been a common occurrence throughout history. Second, if everyone did actually have to pay their debts, then there would be nothing to stop banks from giving irresponsible loans, and the whole system would fall apart. This is essentially what happened in the lead-up to the global financial crisis of 2008, as certain investment banks competed to be one of those who were deemed ‘too big to fail’ so that they could make far riskier investments than they normally would, knowing that they would be bailed out by their host governments while mortgagees lost their homes. This intriguing book is intended to provide the groundwork for a public conversation about debt that should have emerged from the ashes of the Global Financial Crisis (GFC), but didn’t because our thinking about humanity has become so caught up in economic language that the present system is naturalized. The book’s twelve chapters present a revisionist account of the history of debt, challenging major assumptions about how debt relations work and how they developed historically. The strength of Graeber’s book comes from his broad-sweeping, but astonishingly detailed, examination of debt across time and space. Covering large swathes of Europe, the Middle East, South Asia, China and North America, the book presents a diverse array of evidence that betrays the ethnocentric and historically handicapped understanding of the world in which we live. Graeber makes it clear that, if we are to even think about avoiding another global financial crisis, then we need to cast aside the most fundamental of our economic assumptions and take a fresh look at the evidence that is available to us. The ‘myth of barter’ is the first focus of Graeber's revisionism. He argues that the history of human exchange relations presented in most standard economic textbooks has things entirely back to front. Rather than moving from self-sufficient households to bartering villages, then to the abstraction of bullion and eventually credit, Graeber says that the order was exactly the reverse: credit came first. People don’t always have the goods on hand to swap at all times, and nor do they want to spend days running around their village trying to undertake a series of exchanges that will eventually turn their chicken into a bushel of grain. True barter only developed later in systems that already had money, and seems to have played more of a ritual function than an economic one. Another equally fascinating observation concerns our contradictory beliefs that debt is immoral. In numerous cultures, creditors have been depicted as a kind of devil sucking away the life blood of their victims. Today, loan sharks and debt collectors continue to occupy the evil slot, while defaulting on a loan is viewed as a sign of laziness or moral weakness. In contrast, Graeber argues that debt, especially reciprocal obligations, is a kind of social glue binding us all together. Debt becomes problematic, however, when policed through violence rather than trust. For the first few thousand years, debt was collected largely local feudal lords who had their own private forces. For the past millienia or two, states have had an increasing monopoly on violence: they command large armies and arsenals, and they guarantee debts at all levels, from the repayment of a credit card to the debts of nations. What is a debt, anyway? A debt is just the perversion of a promise. It is a promise corrupted by both math and science. If freedom (real freedom) is the ability to make friends, then it is also, necessarily, the ability to make real promises. It’s far from a manifesto, but if Graeber and others are correct that our knowledge of economic history is so far off the mark, then we have some work ahead of us.